I just received my gorgeous Hero Arts Color Layering Orchid Stamp and Die Sets from the Stamp, Ink, Paper Store so you know I had to use them! Aren't these orchids gorgeous? They are so pretty, you don't need much else! 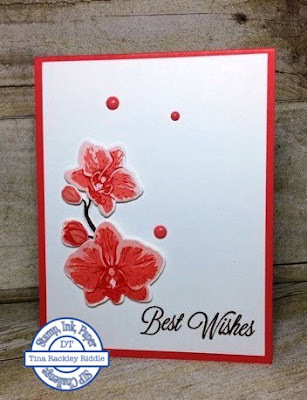 I stamped my orchids onto 80 # Neenah Crest Solar White Cardstock. I used SU Blushing Bride for the bottom Orchid layer. The second layer was SU Flirty Flamingo and the last layer was Altenew Rouge Ink. The branch and the Best Wishes sentiment were stamped in SU Chocolate Chip Ink. My cardbase was SU Watermelon Wonder Cardstock and the top layer was more of the 80# Neenah Crest Solar White Cardstock. 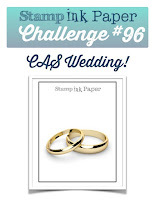 I added three enamel dots to finish this CAS card off. I love the simplicity of it!